The game of golf has been a tradition in Loughrea for almost a century. The original course – the first of three – was located at Knockanima/Earslpark on elevated lands adjoining the Eastern boundary wall of what was then The Workhouse and now known as St. Brendan’s Hospital. A feature of the layout of the course was that one hole was sited at the Long Point on the lakeside of the Woodford road. When that original spread was first used is difficult to pin-point. Before the outbreak of the Great War however, it was decided that a more suitable if less scenic site having fewer stone walls bisecting it, should be found. Sites as Baunoge, Masonbrook and Caheronaun were viewed but eventually 60 acres of hilly land beside the Kincullia road at Caheronaun were secured at a nominal rent. The founding fathers of this new enterprise as recorded in the club membership card for 1914, which has been loaned to me by Mrs. Eilish Pringle whose late father Mr. J. J. Hanafin, was a member of the committee. The committee was: President, John J. Smyth, Esq., J. P. Masonbrook; Vice President, P. J. Davy, Esq., J. P.; Captain, Charles Shubrick Graham, Esq., Solicitor; Hon. Treasurer, P. Glynn, Esq., National Bank; Hon. Secretary, D. V. Lambkin; Committee: Revd. Robert Bradshaw, Killinan; Rev. H. Brennan, Adm., J. J. Byrne, A. D. Comyn Ll.d, solicitor, Laurence Conway, E. C. Fitzpatrick, J. J. Hanafin, J. Hosty, A. M. Toole, R. H. Bell. By the mid 1920’s support for the club began to come an ever widening section of the whole community. So rapid was growth that by the late 1930’s the club deemed it feasible to secure the services of a resident professional and Mr. J. Gaffney from Dublin was appointed. That in addition to being a competent teacher he was also a top class player was evidence when he established a course record of 29 shots for Loughrea’s 9 hole spread. During the emergency restrictions of the World War II era it became increasingly difficult to obtain the clubs goods needed and interest waned to such a degree that the club as such ceased to function. Only a mere handful of super enthusiasts led by the late Mr. Paddy Corcoran who paid the greenkeeper, Charlie Kiernan, out of his own resources, kept the flag flying. Amongst those who in time came to share Paddy Corcoran’s dedication and commitment in the 1940’s was the late Dr. Martin Dyar. In time he became chief motivator in having the land for the present course purchased from the late Mr. Larry Smyth, Earlspark. His dream of a new 9 hole course at Graigue became a reality and was declared officially open by the late Dr. William Philibn, Bishop of Clonfert in 1954. Had Dr. Dyar survived to see ‘his’ spread extended to it’s now magnificent holes, he would be a happy man indeed. An excellent spirit of camaraderie and sportsmanship has always prevailed in the Loughrea club and it’s friendly atmosphere has won favourable comment from visiting players down through the years. The newly extended course has been solidly laid on the foundation of the old 9 holes and will ensure that Loughrea is a place where a game of golf will continue to be enjoyed. 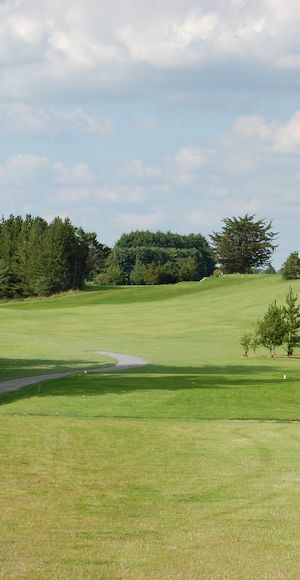 • The name of the club shall be THE LOUGHREA GOLF CLUB. • The affairs of the club to be managed by a committee, consisting of Captain, Hon. Treasurer, Hon. Secretary and such other members as shall be elected at the Annual General Meeting. Four to form a quorum. • The Annual Subscription: Family 30s. ; Gentlemen £1; Ladies 10s. No member shall be considered a member until his or her annual subscription has been paid. • Any visitor on being introduced by a Member, can have the use of the links at the rate of 1s. per day; 2. 6d. per week; and 5s. per month. • If a ball lodges in a cart track, cow track or well-defined hoof-mark, or sheep track or within six inches of animal droppings, it may be lifted and dropped within one club length behind without penalty. The mature testing 9 hole 1954 course was redesigned and expanded to 18 Holes in 1992. This development was undertaken under renowned course architect Eddie Hackett, one of the most prolific course designers in Irish golf history. Further expansion occurred in 2002 when additional land was purchased and developed adding approximately 1,000 yards to the length of the course. Four new holes and greens were constructed and three others modified. This development resulted in making the course a Par 71 for Men and Par72 for Ladies.